We’re super excited to announce the June winner of our #PicturingTrails photo contest! 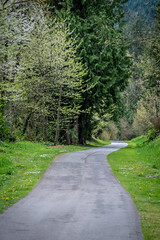 Meryl Schenker took this photo on the Preston Snoqualmie Trail and got 69 likes! She also met all the criteria for the contest (pays to read the rules and regs!) since she took the shot from one of our Regional Trails. We can’t wait to give her the prize of an S-Zone Camera Bag, an REI Camp Blanket, a Klean Kanteen Water Bottle, and a pair of tickets to see Willie Nelson at the Concerts at Marymoor! Want to be our July winner? Go to PicturingTrails.com and follow the steps to win! We’ll award our July prizes to the image that meets all the criteria and has the most likes. So get out there, visit a Regional Trail near you, snap a photo on your phone and enter to win!